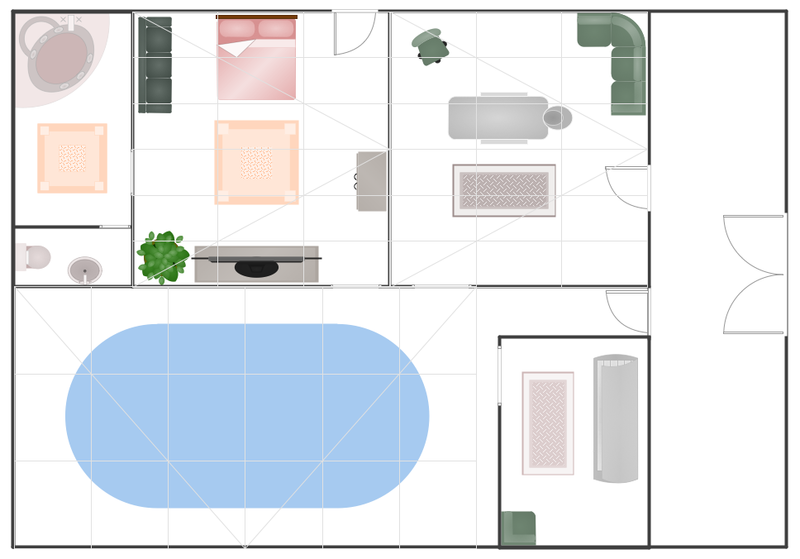 Designing Spa Floor Plan? What can be easier for ConceptDraw DIAGRAM users? Use the tools of Gym and Spa Area Plans solution from Building Plans area of ConceptDraw Solution Park to depict any of your ideas for the Spa Floor Plan. 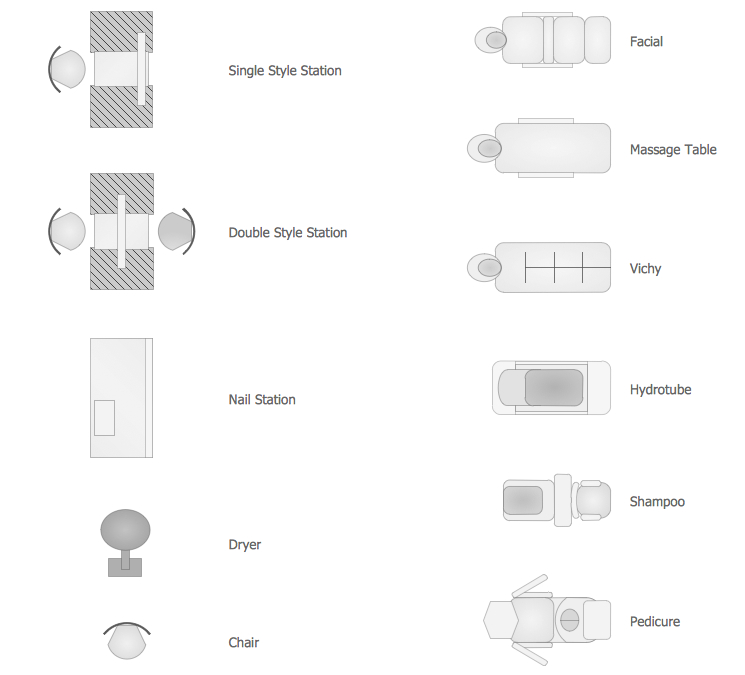 Gym and Spa Area Plans Solution offers you the Spa library with 11 vector shapes of Spa equipment which were previously prepared and you need just drag the desired from them to your document. Or if you want to draw more faster - use the predesigned templates and samples from ConceptDraw STORE. They are so various that you will exactly find the needed for you. The Spa Floor Plan samples you see on this page were created using the Gym and Spa Area Plans Solution for ConceptDraw DIAGRAM An experienced user spent 10-15 minutes creating every of these samples. Use the Gym and Spa Area Plans Solution from the Building Plans area to draw your own Spa Floor Plan of any complexity quick, easy and effective. All source documents are vector graphic documents. They are available for reviewing, modifying, or converting to a variety of formats (PDF file, MS PowerPoint, MS Visio, and many other graphic formats) from the ConceptDraw STORE. The Gym and Spa Area Plans Solution is available for all ConceptDraw DIAGRAM or later users. You have some interesting design home office ideas and you want to inscribe them as soon as possible? 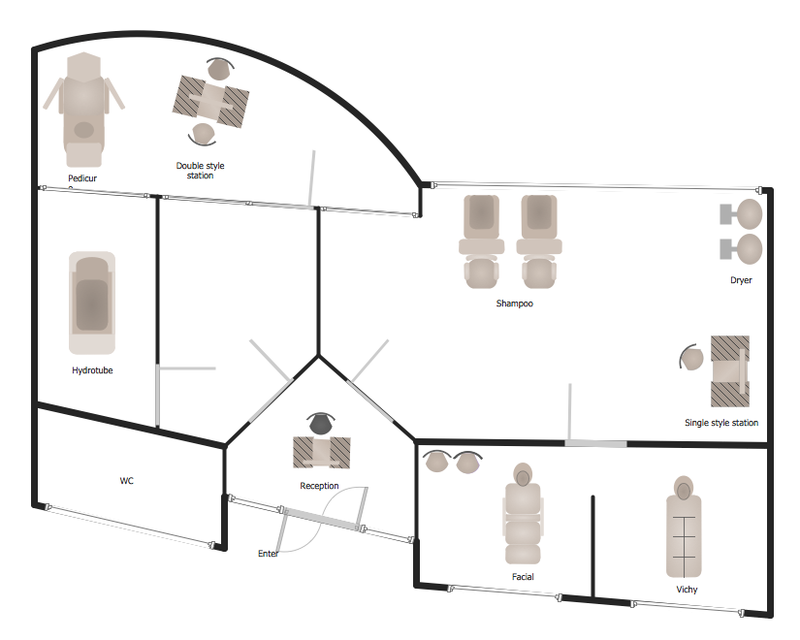 ConceptDraw DIAGRAM v12 software extended with Office Layout Plans Solution from the Building Plans Area will help you.